How do you feel about politics? Religion? Business and the company you work for? Are your feelings the same today as they were a year ago? Five years ago? Would you repeat today some of the more inflammatory statements you made when you were green and just learning how to play the game? People change but there are forces who like to point to who we were then as a show of why we can’t be trusted now. Social media makes it easy; especially now that Google is including Twitter tweets in search results. That’s why more and more people are joining the Tweeter-deleters; a select group of social media users who systematically delete their social media history on a regular basis. Kevin Roose of Fusion recently posted a fascinating article about the delete elite. He says, that even though there are plenty of cases where the past literally came back to destroy people, the folks he interviewed were more about the moment than the past. Twitter wants them kept forever so they leave an indelible trail back to the app when people search keywords online. Facebook wants you to think of the site as a permanent record of your life that you can look back on and reminisce. You wouldn’t throw out photos from the family photo album, would you? But there are plenty of people who wish they’d never fallen into that trap in the first place. One wrong phrase – taken out of context 3 years later – can be enough to hang a new CEO who used to be freer with his thoughts on just about everything. Just Google the phrase ‘fired over Tweets” and you’ll be amazed by how often it happens. 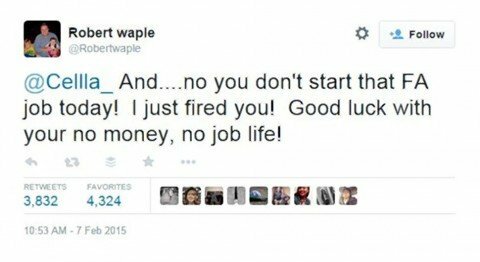 Many people who were fired because of a Tweet got what they deserved. Teachers, journalists, police officers and other trusted figures shouldn’t be making inappropriate, racist, sexist or vulgar statements on social media. Let’s take that a step further; no one should be making inappropriate, racist, sexist or vulgar statements on social media. Doesn’t matter what your business is; as soon as you cross that line you’re asking for trouble. You can yell freedom of speech all you like, but the reality is, no one wants to do business with someone who can’t control themselves in a public forum. Perhaps you’re not like that. Maybe you’ve never said anything on social media you wouldn’t say to your mother. That’s wonderful, but that doesn’t mean your statements from a year ago are worth saving and revisiting. Deleting old social media posts is as much about cleaning out internet clutter as it is about protecting your reputation. Snapchat understands that. Their entire raison d’être is the auto-destruction of posts made on the app. Probably a good thing, as the loose lipped teen users of today are the high-powered public figures of tomorrow. Remember that photo you Tweeted from that wild club during Spring Break? You might want to delete that now before those political aspirations kick in. To delete or not to delete? That is today’s question. At one o’clock in the morning on the east coast, a blogger woke to the sound of 150 email notifications blowing up her phone. The poor thing was startled out of bed, thinking some horrible disaster was rocking the world, but what she found was a humorous / annoying / confusing stream of emails from bored / amused / unhappy bloggers who were all being contacted en masse thanks to the invention of the “reply all” button. Here on the west coast, I also received the same 150+ emails but, lucky for me, I was awake and able to not only process, but enjoy, the carnival of words. It was an interesting hour that both harmed and bolstered the reputation of the “offending” company. How can that be? I’ll tell you. What happened was this. A company that specializes in placing ads on highly-trafficked blogs created a broadcast email account so they could easily reach everyone on their mailing list. Unfortunately, the list name was set up in a way that allowed anyone on the list to “reply all”. Enter one unaware blogger who simply wanted to know why the payment she received didn’t match her monthly payout statement. A legitimate question, but instead of sending it to the proper customer service email, she sent it out to the broadcast email of 300+ bloggers. The first few people responded with confusion. Why did I get this email, they asked (using “reply all”) and that’s when those brilliant wordsmiths caught on. After that, bloggers began replying with greetings and introductions to their own blogs. Some were particularly witty while others tried to slam the lid shut by responding with requests for people to stop responding. Including one from a famous blogger with more than 1 million Twitter followers. Incredibly, the delighted emails trumped the angry emails 10 to 1 until another round of realization set in. Many of the bloggers on the list, including myself, wondered why this company even had our email addresses in the first place. I’m not a client, but I think I may have checked them out once. Apparently, that was all they needed to grab my email address and add me to their lead list. As the emails continued, the tide shifted from happy to weary as the novelty wore off. My spam queue was loaded and emails from “real” people began to bounce. Not good. Not good. At some point, one clever blogger decided to take the party to Twitter. A hashtag was created and more banter ensued. Then. . . oh, the next realization was the biggest. The email that had started it all was brought up again and for the first time, we all actually looked at the numbers quoted in the message. This blogger was making thousands of dollars in ad revenue from the “offending” company. And maybe that was the point all along, suggested another. Perhaps the entire mess was actually a bizarre ad campaign to get us all to sign up as partners? Think about it; if they wrote you and said you could make thousands per month, you’d see it as spam. But a misdirected message? What could be a better, more honest, reveal? It took four hours for the company to discover the problem, plug the leak and issue an apology to the same “reply all” list. Now that the dust has settled; new relationships have formed and the woman who started the storm has to be looking at the highest traffic numbers she’s ever seen in a 24 hour period. As for the company at the root – incredibly, it sounds like they’ll be signing contracts with a few new bloggers. This time, “reply all” seems to have worked in their favor. Most of the time, it doesn’t end as well. Every year, we see stories about workers who were fired and confidential information that was leaked due to an errant reply all. Don’t wake up to an email nightmare. 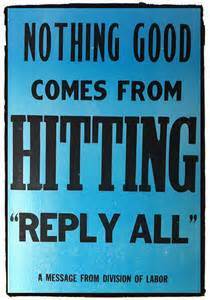 Double check the settings on your broadcast mailing lists to be sure that “reply all” has been disabled. And to the company at the heart of this incident; if this was intentional, it was both clever and insidious. Please, don’t do it again. Most of us have been known to stretch the truth now and then. We embellish to impress, to keep up with those around us or simply to make a story more entertaining. No harm, no foul. Even if you get caught in the lie, it’s only embarrassing for a little while and then it’s back to business as usual — unless you’re a politician, a highly-visible CEO, or a news anchor. It’s been a tough week for the news industry. 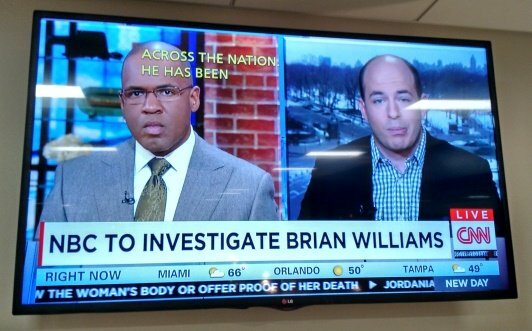 A sports anchor was shot in San Diego; a beloved news veteran was killed in a car accident and then there’s Brian Williams. In comparison to the other two events, Williams’ “misrepresentation” is inconsequential but the media and the public aren’t about to let him off the hook just yet. The trusted NBC news anchor has been telling the story about his close call with an RPG in Iraq for years. If you’re interested, CNN has gone so far as to detail each time the story was told in public with notes on how the story changed. Reading this, it seems like Williams might have been using the royal “we” when he told the story on the news, but whether or not he lied intentionally, at this point, isn’t the issue. The issue now is that he’s lost the trust of the nation and that’s not just a severe blow to his career, it’s a tough break for his employer, too. That decision could cost them viewers. It was a tough call and not because what Williams did was so horrendous and inexcusable. It was a tough call because one person became greater than the team. Williams will be fine, but there are 100’s of NBC news employees who are going to have to work even harder to gain back the trust of the public. And in the news game, a drop in ratings means a drop in revenue and that’s bad news for everyone at NBC. We’re all human and humans make mistakes, but when your star employee makes a public misstep there’s no stopping the ripples. Fair or not, key employees have to be held to a higher standard. The best way to avoid trouble is with proper training from human resources and / or legal council. In addition, speeches need to be vetted and employees must be cautioned to stick with the script. It’s also a good idea to check the public bios of high-profile employees on a regular basis. These blurbs are routinely emailed, shared, copied and pasted and that can lead to typos and misinformation. In these days, where anything we say can be instantly captured and shared on the internet, it’s even more important that our star players stick with the facts whether they make a good story or not. By now, you’ve certainly heard the tale of Cella, Robert and the Jet’s Pizza public firing. No? Here’s a quick recap. A teenager in Texas decided to use Twitter to express her displeasure at having to start work at a local pizza franchise. Even though she didn’t name the pizzeria, the manager somehow saw her Tweet and decided it would be appropriate to fire her before she ever started work. Trouble is, he decided to fire her in public, on Twitter. And he added a few colorful words of his own so as not to be outdone by the petulant teen. Cella then shared Robert’s Tweet with her friends and within 48 hours, the two of them were internet celebrities. The fact that this story even made the news is a testament to how social media has become a form of entertainment. It’s like reality TV, streamed to your smartphone and computer 24-7. And once a story rises to the top, it takes on a life of its own expanding well past its original borders. Now, instead of being a small town faux pas, Robert Waple made Jet’s Pizza a household name for all the wrong reasons. Now, 300 franchise owners all over the US are feeling the effects of one person’s misstep. What was Waple thinking? Clearly, he wasn’t thinking at all or he wouldn’t have let a disgruntled teen get the best of him in public. He should have seen her Tweet as a godsend. A chance to prevent the problems that would have come up had he allowed this unhappy young woman to work in his pizzeria. When Cella posted on Twitter, she was giving Waple a chance to save his store’s reputation, instead he used her gift to hang himself. We all say things we wish we could take back but when you say them in writing in a public forum, that’s not an option. Even when you delete the Tweets, as both parties did in this case, the captured images are still on the web for everyone to read and share. The only saving grace in a case like this, is that the disgrace will be short lived. In a few days, Cella and Robert will have run down the clock on their 15 minutes of fame, but the harm to Jet’s Pizza’ reputation is going to take a little more effort to repair. If you live near a Jet’s Pizza franchise, give them a thumbs up and order one of their heart pizzas for Valentine’s Day. They can use all the love they can get.